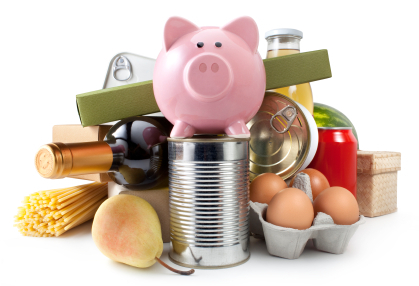 Have you noticed how much of your overall budget you spend on groceries? Grocery shopping is a significant expense for most families and households, but there are ways to make it more affordable. Shop on a full stomach. You’ll buy less snacks and/or things you don’t usually buy - and only buy groceries, not gifts and all the extra stuff, at the grocery store! Go armed with a list and stick to it, especially if your kids are “helping”. Plan your meals for the week before you shop and then buy what’s on the menu. Start with planning for 3 or 4 days if all week seems too much. Shop only once a week. You’ll tend to spend more if you stop at the store every day or several times a week. Shop when you have energy and aren’t worn out from a busy day. It’s easier to focus and make wise choices when you’ve got energy and aren’t preoccupied. Return your bottles and cans for the deposit that you paid. If you've got kids, get them to help with this job and let them keep the cash they earn. Shop in familiar stores when you’re tired, stressed or in a hurry. You’ll find what you need and be able to get out with what you need quickly. Plan meals so that you have leftovers for lunch the next day, or freeze leftovers for a quick meal another day. Package your own treats, juices and snacks. Buy the large package or snacks and a box of baggies and make your own individually wrapped packages to grab on the run. Buy less canned and packaged convenience foods and shred your own lettuce and cheese (cheeses often freeze well too!). Clean out your fridge and cupboards once a month. Use up what you bought before buying more. Organize your food storage cupboards and drawers. If you don’t know what you have or can’t find what you bought, you’ll end up buying more of the same unnecessarily. If you stock up, watch expiry dates and package the food to preserve it as long as needed. If you buy large packages or meat, pre–cook or marinate it and then freeze it to speed up meal times. If you know that you’ve got food ready at home, it’s less tempting to eat out. Spend some time once a week washing and/or cutting up fruit and vegetables. This will speed up dinner and lunch preparations and provide healthy snacks that are ready to go. Don’t buy snacks on the run. They are often less healthy and more expensive. Get creative and try new foods. You may find less expensive food that you enjoy just as much! Shop with a calculator and add things up as you put them in your cart. If you're shopping with kids, give them the job to tally what's in the cart. It will help you stick to your spending plan. Learn how to cook or bake. Hit up a family member for help or take a class. Buy non–food grocery items like detergent or garbage bags at a discount store. Only buy what you need and can afford; 3-for-1 is only a good deal if you can use three. Price check and shop around for discounts on items you buy regularly. 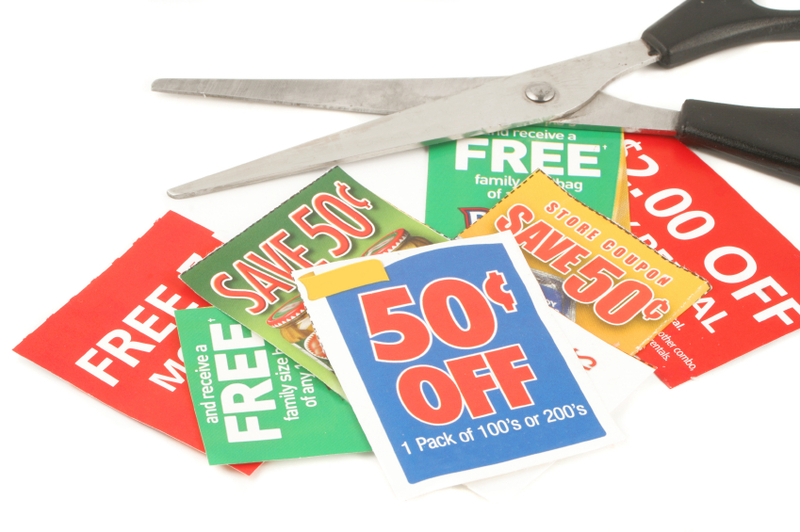 Use store and manufacturer coupons when you can. Consider using one of these grocery apps on either a smartphone or tablet. Remember that smaller sizes can sometimes be a good deal. Do the math, either on your phone or with your calculator. Don’t automatically overlook no-name or store brands. Many are made by the brand name companies, just with a different label. Even if it’s “on sale,” it’s only a good buy if you will use it! If you only want to try one tip, make it a really good one. In fact, the one tip that will likely save you the most money when you're grocery shopping on a budget is to plan your meals and snacks ahead of time. 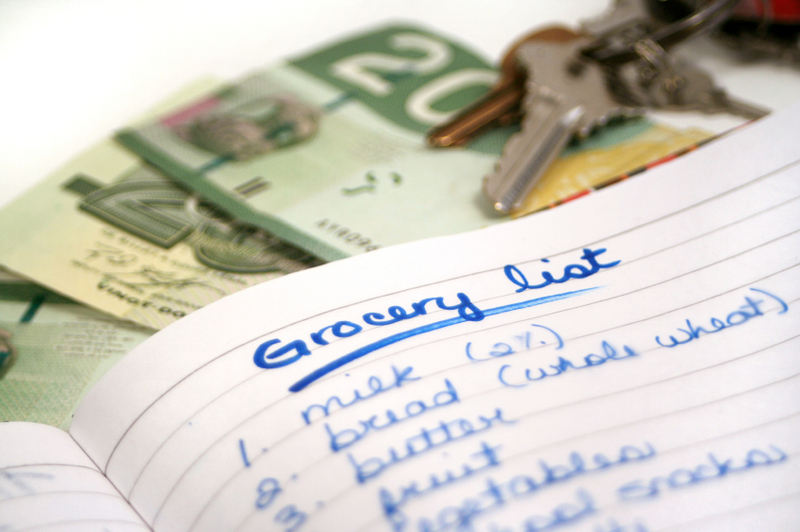 By planning ahead, you can make your shopping list based on what you already have, what you still need to buy and what's on sale. Making an easy, nutritious, budget-conscious menu plan doesn't have to be hard. Start with two or three dinners, plan for leftovers so that you've got work lunches, add in some snacks and keep quick and easy breakfast foods on hand. Just like with anything new, give it a try before you decide that you don't like it. Saving time and money might just agree with you and your budget! What tips did we miss? Share your tip by adding a comment below! Save on Household Expenses - It's Never Too Early for Some Spring Cleaning! I stumbled over here coming from a different web address and thought I might as well check things out. I like what I see and look forward to learning more. Greetings from Idaho! I'm bored to death at work so I decided to browse your site on my iphone during lunch break. I really like the information you provide here and can't wait to take a look when I get home. I'm amazed at how fast your blog loaded on my mobile .. I'm not even using WIFI, just 3G .. Anyways, good blog! Oh my goodness! Incredible article dude! Thank you, However I am having problems with your RSS. I don't know why I can't join it. Is there anybody else having identical RSS issues? Anyone who knows the solution will you kindly respond? Thanx!! As said above, the only reliable tool is a shopping list and sticking to it. I use the one on my phone so it is always with me and also with my kids and partner. Don't forget to check out your local farmers market! I know that's how I save a ton on eggs and veggies, just don't get drawn in by the neat nicknacks. You can save a lot of money in general by simply being aware of where your money is going. I use an app called expense manager. Once you eliminate the "where did my money go" syndrome, you start to avoid impulse buying naturally, knowing that you'll have to face the charts and graphs at the end of the month, there's no buying and then quickly forgetting about it. The day old produce will usually be "reduced to clear (upwards of 50% off)". Just because it is not 'fresh' and is day-old does not mean they are not as good as the fresh produce. Frequently, reduced produce may be found on a separate shelf, but could also be mixed in with the regularly priced produce. Be aware that other items in the grocery store 'could be reduced to clear'. This could include facial tissues, toilet paper, dish and laundry soap, etc. Also buy the store brand products an example being 2L PC brand ginger ale is 87 cents vs 2L of Schweppes ginger ale at $ 1.25 plus tax. Great article! Our top tip is organizing a swap with other parents so you can get your shopping done without the kids! These tips are not all that great for people who really need to have a small food budget. First don't buy juice or soda at all and drink water. Get your own water filter so it's not bottled water. Tea is the next cheapest thing to drink. Buy only enough milk for cereal and dont buy boxed cereal. Then buy oatmeal. Don't buy snacks of any kind. No chips crackers cake etc. Buy baking supplies and bake your own cookies and cakes and pancakes and waffles. Older kids can learn how. Don't buy lunch meat buy a half ham instead. Or use tuna fish or left over turkey and chicken. With the money you save on junk buy fresh fruits and vegetatables as well as frozen. Learn to make soup and stock. Learn to bake bread and biscuits from scratch. It's easy. pack simple lunches for your children if school lunches aren't free for you. A sandwich a piece of fruit and a cookie thst they baked. Don't pre prep or wash your veggies or they will spoil faster. Check your fridge every few days to use leftovers or freeze them. Freeze meat scraps and vegetable scraps and bones to make soup once a week. Buy pasta beans and lentils on sale to add to your meals. Keep onions garlic potatoes brown rice and spices on hand for your meals. Eggs are great for breakfast and dinner dishes with that ham you bought on sale. Buy canned tomatoe sauce rather than made up spaghetti sauce and add spices and sugar to taste. Consider getting a pressure cooker and rice cooker. Learning to cook will save you a huge amount of money. I rarely use coupons for food because most of the food coupons are for packaged food and junk. Excellent Small Food Budget Tips! Hey Diane, Thanks for taking the time to publish these tips. They're perfect for anyone who is trying to work with a small food budget. It is important to take kids so they learn how to shop for food. Maybe one at a time if you have lots of kids. With my son, I allowed him 3 choices, and sometimes he would choose things I would have bought anyway. If he wanted a fourth item, he had to put one other back because 3 was the limit. I really appreciate this article of yours and really found it helpful. The single most common error is shoppers do not consider nutrition verses the cost. Value items that are offer no value nutrition wise are no value or bargain. Stores always like to discount the junk foods and soda but real food like fruits and quality meats particularly Seafood are going to cost you money but its often better money spent that buying pre made garbage meals that contain up wards of 70% fat and loaded with flavor enhancers . Shop the corners of the store for real foods like meats,fruits vegs and avoid the canned packaged garbage that offers no nutritional value like MAC and cheese or that crap rice o roni . R.Fried beans are good fiber and cheap but watch the fat often the cans are loaded. So what do you buy? Consider 70% of americans have health issues from eating wrong and trying to be to cheap can cost your health. Eat less but eat healthier. Go ahead and buy the Salmon but just a 6-7 ounce portion or the higher quality beef . Chicken meat is a joke!!!!! it has low protein and this is why you lose weight eating it and the fried chicken recipe ends up just being 75% fat. Also stay away from burger meat!!!! most is ground garbage from multiple animals and can has many health risks not to mention the stores who like to remix old into new and resell . 1/2 of discount stores pull this trick and get away with it. What do you eat then? Try this its called the Roman diet. If it did not exist during the roman empire dont eat it!!!! MEats, fruits veges ,whole grains and avoid the middle isles of the stores that is mostly garbage unfit to eat. Boring Yah but your health is #1 and its not as bad as people think. Also buy in season and buy only what you can use for 1 week. make a list stick to it and above all eat before you go to the store!!!!!! Never gfo to the store on empty stomach . I have 22 years experience as a chef and nutritionist and welcome questions particularly for seniors on a budget with limited income. I can save you money and save your health. Great article! Personally, we like to plan ahead when it comes to food. My wife meal preps on Sundays, cooking for at least 3 days worth of meals (we also take leftovers to work). This saves us quite a bit of money throughout the week. Highly recommended. Also, since we live in the states, we tend to use different apps that offer rebates, coupons or cash backs.